Appropriately has Genesis been termed "the seed plot of the Bible," for in it we have, in germ form, almost all of the great doctrines which are afterwards fully developed in the books of Scripture which follow. In Genesis God is revealed as the Creator-God, as the Covenant-God, as the Almighty-God, as well as "the Most High, Possessor of heaven and earth." In Genesis we have the first hint of the Blessed Trinity,of a plurality of Persons in the Godhead—"Let us make man in our image" (Gen. 1:26). 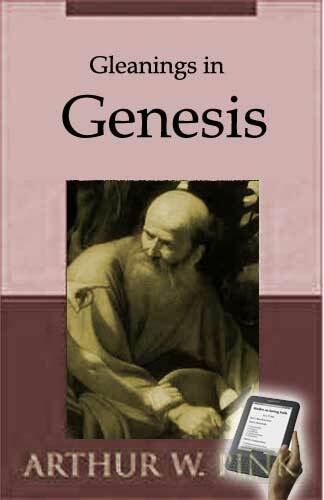 In Genesis man is exhibited. First as the creature of God’s hands, then as a fallen and sinful being, and later as one who is brought back to God, finding grace in His sight (Gen. 6:8), walking with God (Gen. 6:9), made "the friend of God" (Jam. 2:23). In Genesis the wiles of Satan are exposed. We "are not ignorant of his devices," for here the Holy Spirit has fully uncovered them. The realm in which the arch-enemy works is not the moral but the spiritual. He calls into question the Word of God, casts doubt on its integrity, denies its veracity. In Genesis the truth of sovereign election is first exhibited. God singles out Abraham from an idolatrous people, and makes him the father of the chosen Nation. God passes by Ishmael and calls Isaac. In Genesis the truth of salvation istypically displayed. Our fallen first parents are clothed by God Himself, clothed with skins: to procure those skins death had to come in, blood must be shed, the innocent was slain in the stead of the guilty. Only thus could man’s shame be covered, and only thus could the sinner be fitted to stand before the thrice holy God. In Genesis the truth of justification by faith is first made known: "And he believed in the Lord; and He counted it to him for righteousness" (Gen. 15:6). Abraham believed God: not Abraham obeyed God, or loved God, or served God; but Abraham believed God. And it was counted unto him for (not instead of, but unto)righteousness. Then, if righteousness was "counted" unto Abraham, he had none of his own.Believing God, righteousness was reckoned to Abraham’s account. In Genesis the believer’s security isstrikingly illustrated. The flood of Divine judgment descends on the earth, and swallows up all its guilty inhabitants. But Noah, who had found grace in the eyes of the Lord, was safely preserved in the ark, into which God had shut him. In Genesis the truth of separation isclearly inculcated. Enoch’s lot was cast in days wherein evil abounded, but he lived apart from the world, walking with God. Abraham was called upon to separate himself from idolatrous Chaldea, and to step out upon the promises of God. Lot is held up before us as a solemn example of the direful consequences of being unequally yoked with unbelievers, and of having fellowship with the unfruitful works of darkness. In Genesis God’s disciplinary chastisements upon an erring believer are portrayed. Jacob is the standing example of what happens to a child of God who walks after the flesh, instead of after the spirit. But in the end we are shown how Divine grace triumphs over human frailty. In Genesis we are shown the importance and value of prayer.Abraham prayed unto God and Abimelech’s life was spared (Gen. 20:17). Abraham’s servant cries to the Lord that God would prosper his efforts to secure a wife for Isaac, and God answered his petition (chap. 24). Jacob, too, prays, and God hearkened. In Genesis the saint’s rapture to heaven is vividly portrayed. Enoch, the man who walked with God, "wasnot," for God had translated him. He did not pass through the portals of death. He was suddenly removed from these scenes of sin and suffering and transported into the realm of glory without seeing death. In Genesis the divine incarnation is first declared. The Coming One was to be supernaturally begotten. He was to enter this world as none other ever did. He was to be the Son of Man, and yet have no human father. The One who should bruise the serpent’s head was to be the woman’s "Seed." unresistingly, on the altar, and from it Abraham "received him back as in a figure from the dead." In Genesis we also learn of the Savior’s coming exaltation.This is strikingly typified in the history of Joseph—the most complete of all the personal types of Christ—who, after a period of humiliation and suffering was exalted to be the governor over all Egypt. Jacob, too, on his deathbed, also declares of Shiloh that "untohim shall the gathering of the peoples be" (Gen. 49:10). In Genesis the priesthood of Christ is anticipated. The Lord Jesus is a Priest not of the Aaronic system, but "after the order of Melchzedek." And it is in Genesis that this mysterious character, who received tithes from and blessed Abraham, is brought before our view. In Genesis the coming Antichrist is announced, announced as "the seed of the serpent" (Gen. 3:15). He is seen, too, foreshadowed in the person and history of Nimrod, the rebel against the Lord, the man who headed the first great federation in open opposition to the Most High. In Genesis we first read of God giving Palestine to Abraham and to his seed: "And the Lord appeared unto Abraham, and said, Unto thy seed will I give this land" (Gen. 12:7). And again, "For all the land which thou seest, to thee will I give it, and to thy seed forever" (Gen. 13:15). In Genesis the wondrous future of Israel is made known. "And I will make thy seed as the dust of the earth: so that if a man can number the dust of the earth, then shall thy seed also be numbered" (Gen. 13:16). "And in thy seed shall all the nations of the earth be blessed" (Gen. 22:18). In Genesis the judgment of God on the wicked is solemnly exhibited. Cain confesses his punishment is greater than he can bear. The flood comes on the world of the ungodly and sweeps them all away. Fire and brimstone descend on Sodom and Gomorrah, till naught but their ashes remain. Lot’s wife, for one act of disobedience, is turned into a pillar of salt. What a marvelous proof is all this of the Divine Authorship! Who but the One who knows the end from the beginning, could have embodied, in germ form, what is afterwards expanded and amplified in the rest of the Bible? What unequivocal demonstration that there was One superintending mind,directing the pens of all who wrote the later books of Holy Scripture! May the blessing of God rest upon us as we seek to enjoy some of the inexhaustible riches of this book of beginnings.